Serving Our Customers for Over 93 Years. In 1926, way back before Facebook, and even before TV, people just didn't know how to waste time. But, being really bored paid off for butcher Fred Angell. He worked to get just the right combination of a special cut and grind of meat and a selected blend of spices. When a deliveryman tasted Fred's new creation, he said, "This sandwich is made right." With that, the Maid-Rite was born. Fred was quite a sandwich maker but not much of a speller. Our select line of seasoned loose meat sandwiches are made from 100% USDA Midwestern fresh ground beef served on a fresh steamed white or wheat bun, with your choice of ketchup, mustard, onion and pickles. Our franchisee tradition that started back in 1926 has been to have individual owner/operators who are well known and well liked within their communities, who take pride in owning and operating a successful Maid-Rite franchise restaurant. This business philosophy has and always will be the backbone of our franchisee network. Many of our original franchises granted in the 1920s are still in operation today. We are proud to say that we now have third generation family members operating family owned Maid-Rites. 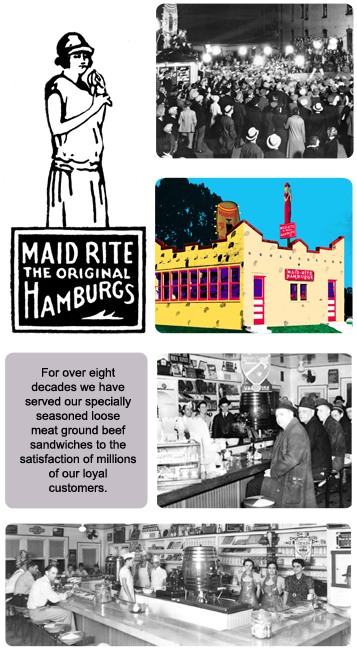 Our family of Maid-Rite Franchisees takes pride in serving our customers! Copyright © Maid-Rite Corporation. All Rights Reserved.